To plug in auxiliary electrical equipment, flip the outlet cover open from the edge of the cover and follow the proper installation instructions that are included with any electrical equipment you install. Maximum electrical must not exceed 10 ampere at 12 volts after engine is started. 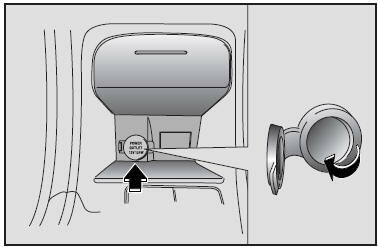 Use when the engine is running, and remove a plug from the power outlet after using the electric appliance. Using when the engine stops or remaining the electric appliance with plugged in for many hours may cause the battery to be discharged. Adjust the air-conditioner or heater to the lowest operation level when you have to use the power socket while using airconditioner or heater. If you have to use to the electrical accessories that draw higher power (vacuum cleaner, lights, cooler, etc.) only use the power outlet intermittently and with greater caution. Long periods of the vehicle not being started (with electrical accessories plugged in) will discharge the vehicle’s battery and degrade the battery life. Cap the cover of power outlet when not in use. Some electronic devices can cause electronic interference when plugged into a vehicle's power outlet. These devices may cause excessive audio static and malfunctions in other electronic systems or devices used in your vehicle.